Before I saw this gorgeous view that made feel so lucky to be alive, it was dark, cold, and 2 AM. I kept thinking to myself then that I should be curled up in my cozy bed and sleeping soundly – what the hell am I doing at the base of Bali’s tallest and holiest mountain? But this is the time of day that all hikers begin their climb up toward the peak to view Bali’s majestic sunrise from one of its highest points. The timing is also purposeful because the trail is strangely clear of fog in the wee hours of the morning, but increasingly becomes more and more foggy during the day. Yup. My coworker and I decided that our Balinese dogs will join us in our hike. 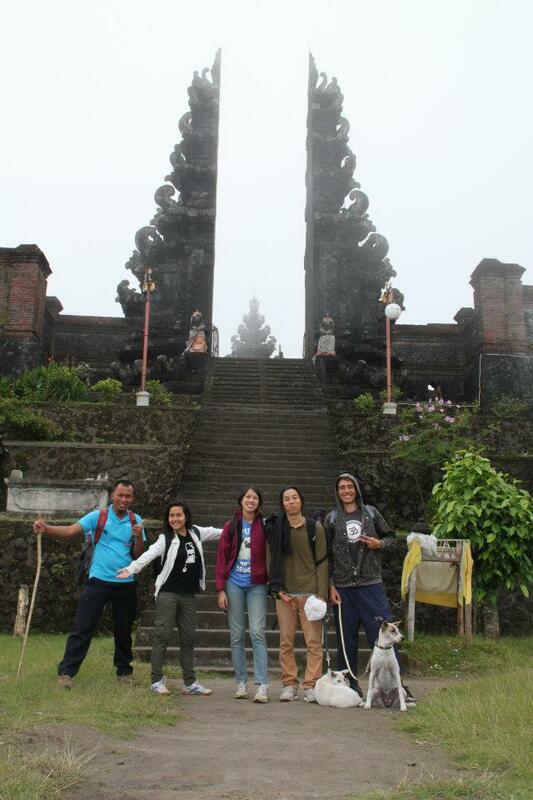 I insisted that because the dogs will be with us, we climb through the shorter route from Pura Pasar Agung, which is still a climb of about four hours to get to the second highest point. The long route is through Besakih, which will take about six to seven hours to reach the highest peak. Both routes end where the panorama is spectacular, so it really just depends on for how long you want to challenge yourself. I specifically said “for how long” because either route is still a challenge. It’s either four leg-burning hours of all incline and no flat land, or six. Near the top, the terrain is rocky and difficult; loose gravel will unsteady your footing and the steep surface will at times force you to climb on all fours. With the dogs, it was even harder because we had to occasionally carry and pass them to the person ahead because they couldn’t make it up on their own. Unfortunately, I never made it to the top. My boyfriend and I stopped just thirty minutes short of reaching the peak, but we were still able to enjoy a gorgeous view of the sky changing color as the sun rises. Had we been more in shape (we hadn’t exercised in nine months), I am pretty sure we would have made it. It’s challenging, but doable. If you like to conquer mountains, I think Mount Agung is a good one to cross off your list, and I highly recommend conquering it with Wayan Widi Asa – he is as good as a guide gets. This entry was posted in Bali, Do, Explore and tagged bali hiking, bali mountain hiking, bali trekking, gunung agung, mount agung.